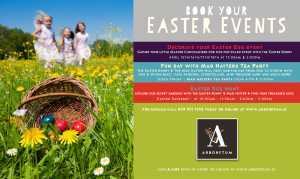 Hop along to the Arboretum Carlow for the egg-tastic Easter egg hunt! Help the Easter bunny & Mad Hatter find all the eggs using the special clues. Event Details: - €10 per child - Easter Egg to take home. - Free Kids Hot Chocolate included. - Event approx. 45 minutes.